Women who have been diagnosed with Stage 1 – 3 invasive lobular breast cancer (ILC) who have not yet had surgery to remove their tumor may be eligible to participate in a clinical trial. This trial is open to all ER+ and/or PR+ HER2- patients (ductal or lobular), however it is being enriched with lobular breast cancer patients to promote a better understanding of how ILC might respond differently to these therapies. 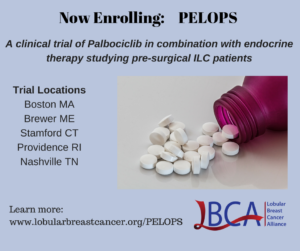 Name of the Trial: Palbociclib and Endocrine Therapy for Lobular Breast Cancer Preoperative Study (PELOPS). Who might qualify? Patients with stage 1 – 3 estrogen and/or progesterone positive, HER2 negative breast cancer, with a minimum 1.5cm tumor, who have not yet had surgery to remove their tumor may qualify for the study. This study is open to both premenopausal and postmenopausal patients. Patients with Lobular Breast Cancer are being recruited specifically to form a key cohort for evaluation. Where can patients enroll? This trial is currently enrolling patients in Boston MA; Brewer ME, Stamford CT, Providence RI; Nashville TN. What happens in this study? This trial has two parts. 1) First, patients will be randomly assigned to one of four groups. Each group will receive a different commonly prescribed breast cancer endocrine therapy medications (Tamoxifen or Letrozole) for two weeks prior to their surgery. These medications are all proven to be effective therapies against breast cancer, and are typically given to patients at the end of their treatment for five years. 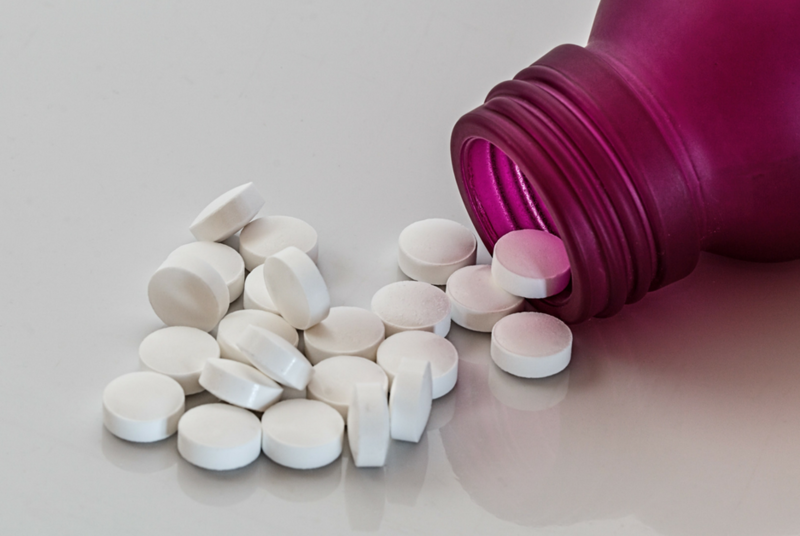 Giving these medications before surgery will allow researchers to analyze the effect of each medication on the tumor to learn which medication might be most effective to treat lobular breast cancer. 2) Patients with estrogen positive breast cancer frequently receive endocrine therapy medications (such as Tamoxifen or Letrozole) for five years after completing their surgery and completing any other necessary treatments. In this study, patients will receive either standard endocrine therapy alone or endocrine therapy plus Palbociclib, a CDK 4/6 inhibitor drug that is currently used to treat some types of more advanced breast cancer. The Lobular Breast Cancer Alliance shares information about ongoing clinical trials for patients with lobular breast cancer for educational purposes only. LBCA does not sponsor or run the clinical trials, and the scientific validity and safety of the trials is the responsibility of the trial investigators. Patients should always discuss their participation in any clinical trial directly with their doctor and learn more by contacting the clinical trial coordinators listed above directly. Learn more about participating in clinical trials.